De faam van Big Star kwamen pas met de jaren. Maar inmiddels komen we bijna om in de Big Star releases. Een live cd met opnames voor een radioshow uit 1974. 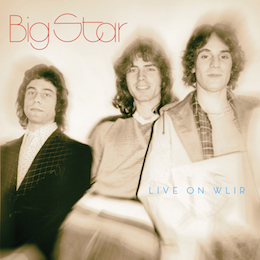 ‘Big Star recorded their second album, Radio City, as a trio, after the departure of founding member Chris Bell. When it came time to tour, original bassist Andy Hummel decided to return to school to pursue his engineering education. With this departure, Alex Chilton and Jody Stephens recruited fellow Memphis native John Lightman to take over on bass duties, and the band readied their live set. Nearly two decades later, those recordings were issued as Live in 1992. Omnivore Recordings is proud to reintroduce those recordings, restored and remastered from the original tapes, as Live On WLIR’. Hier de trailer.